The next IEEE International Conference on Wireless for Space and Extreme Environments (WiSEE'16) will take place in Aachen at the RWTH University. Gholamreza Alirezaei (general-chair) has brought this event to Germany in order to strengthen the collaboration between industry and academia. The attendance of experts from NASA, ESA, CSA, DLR, and many other space agencies is expected. 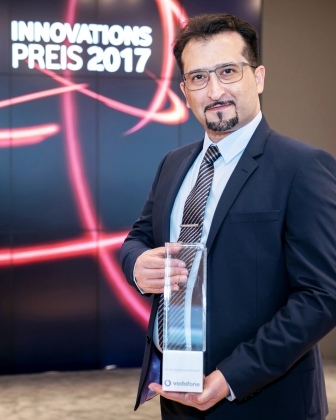 Gholamreza Alirezaei received the prestigious Vodafone prize for his contribution to sensor networks in Düsseldorf, Germany. Jose A. L. Calvo, Gholamreza Alirezaei and Rudolf Mathar received the Best Paper Award for their contribution "Wireless Powering of Drone-Based MANETs for Disaster Zones" at the 2017 IEEE International Conference on Wireless for Space and Extreme Environments (WiSEE'17) in Montréal, Canada. H. Alper Tokel, Gholamreza Alirezaei and Rudolf Mathar received the Best Paper Award for their contribution "Integrated Network Design for Measurement and Communication Infrastructures in Smart Grids" to the 26th International Telecommunication Networks and Applications Conference (ITNAC 2016) in Dunedin, New Zealand. Gholamreza Alirezaei received the Friedrich-Wilhelm Award of RWTH Aachen for his outstanding work "Optimizing Power Allocation in Sensor Networks with Application in Target Classification". Gholamreza Alirezaei, Michael Reyer and Rudolf Mathar received the prestigious ITG Award 2015 for their paper "Optimum Power Allocation in Sensor Networks for Passive Radar Applications" at the Berlin-Brandenburg Academy of Sciences and Humanities. Gholamreza Alirezaei received the Borchers Badge for his outstanding work "Optimizing Power Allocation in Sensor Networks with Application in Target Classification" at the RWTH University. Gholamreza Alirezaei and Rudolf Mathar received the Best Paper Award for their paper "Optimum Power Allocation for Sensor Networks that Perform Object Classification" at the IEEE Australasian Telecommunication Networks and Applications Conference (ATNAC'13). Gholamreza Alirezaei, Rudolf Mathar and Pouya Ghofrani received the Best Paper Award for their paper "Power Optimization in Sensor Networks for Passive Radar Applications" at the Wireless Sensor Systems Workshop (WSSW'13), co-located with IEEE International Conference on Wireless for Space and Extreme Environments (WiSEE'13).